With promoter Joe L. Floyd at the helm, promotion was a huge part of the early success of KELOLAND TV. And the Dakota Territory Centennial Gold Rush was the biggest promotion of all. An estimated 100,000 people crowded a field near Manchester, SD. 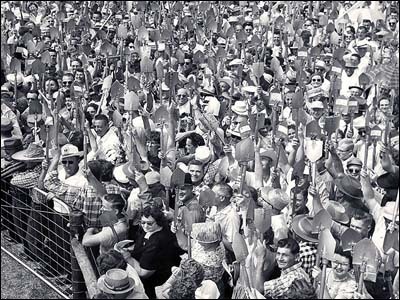 Hundreds of contestants armed with gold shovels dug for a chance to win $10,000, a new car or many other prizes. A nervous Joe L. Floyd had to wait until nearly the end of the digging before Mrs. Floyd Carlon stepped forward with the winning capsule. The promotion also included celebrities like Lawrence Welk and a young western actor named Clint Eastwood. The Gold Rush is still considered the biggest promotion in the history of KELOLAND. Promotion still plays a key role in connecting viewers with KELOLAND TV and advertisers. KELOLAND TV again achieved a television milestone with the construction of the 2000-foot tower near Rowena, SD. The new tower was the highest tower allowed and again expanded the coverage area of KELOLAND TV. Viewers on the fringes of our coverage area now received a better picture. Because of the tremendous construction cost the tower was shared with KSOO-TV. 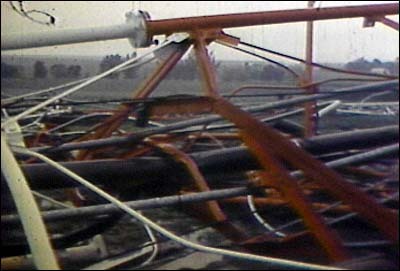 June 24, 1968 - Rowena Tower Collapses! As fate would have it, the new 2000-foot tower, in service less than a year, fell to the ground when a North Central airliner clipped a guide wire. Luckily, the plane landed safely with no injuries. KELO was not so lucky. The tower was destroyed. 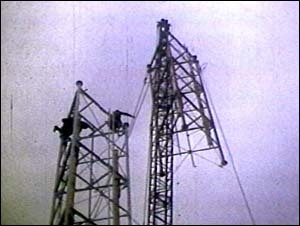 KELO engineers had the station back on the air in three days operating from the old 1000-foot tower near Shindler. It wouldn't be the last tower collapse the station would experience. 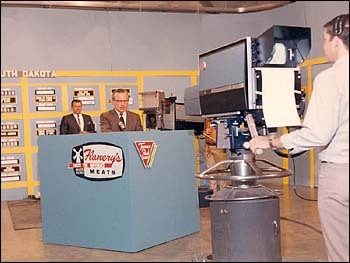 Networks had been providing programming in color for a few years, but now KELOLAND TV was the first station in the area with live color cameras. Now viewers could see local news and programming in color. At the time a 20-inch color TV cost about $400. In today's dollars that's about $2,000. 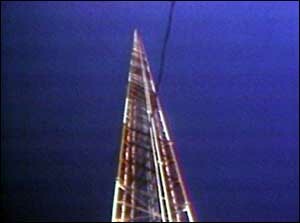 Again, KELOLAND TV erected a 2,000-foot tower to replace the one that collapsed in the airliner incident in 1968. Viewers once again would benefit from the strong signal from this highest of all towers. This tower would serve viewers longer than the original, but would not last as long as expected.